A 30-story condominium in North Miami Beach, FL suffered slow drain and clog issues in laundry rooms on each floor. And owners sought to fix the problem – quickly. That’s when they called Gregg D’Attile, owner of Art Plumbing AC & Electric in nearby Coral Springs. Serving the Ft. Lauderdale-Miami area, Art Plumbing AC & Electric forged an excellent reputation for superior plumbing, drain cleaning, air conditioning and electrical services to local residential and light commercial customers since 1983. The company’s 48 trucks tackle troubles within a 50-mile radius of their head office. And that’s when Art Plumbing AC & Electric rode to the rescue with their Model JM-1450™ electric water jet from General Pipe Cleaners. Part of General’s popular Jet-Set® line of water jets, the JM-1450 uses high pressure water to clear drain lines clogged with grease, sand, sludge, and ice. 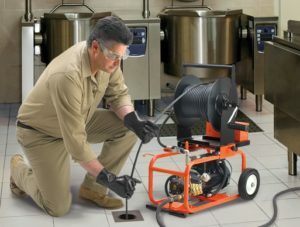 Perfect for smaller, indoor jobs with 1-1/2” to 4” lines, the compact, portable, environmentally friendly machine generates 1500 psi at 1.7 gallons per minute – yet only pulls 13 amps. Also equipped with Vibra-Pulse® technology and General’s standard safety features, the rugged JM-1450 is powered by a 1-1/2 hp dual capacitor enclosed motor with an in-line ground fault circuit interrupter. Vibra-Pulse helps the hose slide around tight bends and farther the down line. It breaks the initial tension between the hose surface and pipe walls, increasing cleaning power. And it separates General’s Jet-Set from competitive machines and ordinary pressure washers. JM-1450 portability proved helpful, too. D’Attile notes that larger, heavier jetters would prove troublesome to transport up a 30-story building – and difficult to maneuver in tight work areas. Not so with the JM-1450. Overall height of General’s machine is just 29”. 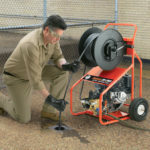 Remove the easily detachable, 150 ft. capacity hose reel with brake – and height drops to just 14”. The JM-1450 also sports a heavy duty frame with two 8” semi-pneumatic tires. And it features a slide-out handle to facilitate rolling it to and from job sites. JM-1450 design and performance gave Art Plumbing AC & Electric the reliability, portability and power to handle the whole job with minimal disruption to building occupants. Starting from the top story, the drain cleaning professionals rapidly and methodically moved, “floor-to-floor” through each of the building’s laundry rooms. “Lather, rinse and repeat!” he smiles. The whole, tedious task took less than three days. And the skill and professionalism of Art Plumbing AC & Electric’s crew earned D’Attile a yearly preventive maintenance contract from condominium owners. D’Attile picks equipment he trusts. That’s why his ample arsenal sports several General drain cleaning and maintenance solutions. Multiple Mini-Rooter® floor-model cable machines for unclogging drains from rooftop to basement – including kitchen, bath and laundry lines. The innovative Kinetic Water Ram™ – the lightweight, hand-held device that safely, quickly and cleanly clears clogs with powerful bursts of compressed air. The Cold-Shot® Pipe Freezing Kit. 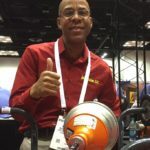 that quickly and safely freezes liquids in steel, copper, cast iron, aluminum and plastic pipes – keeping systems fully pressurized so plumbing pros can rapidly repair and service lines without closing main supplies or draining pipes. 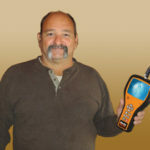 Finally, Art Plumbing AC & Electric employs large numbers of General’s Flexicore® Closet Augers – the most durable closet augers in the industry. “I’ll bet we’ve bought hundreds of them since 1983!” Gregg D’Attile declares. But back to the JM-1450.